Recognizing Canada’s distinct corporate governance framework, the aim of the 30% Club Canada is to include both board Chairs and CEOs to achieve better gender balance at board level, as well at senior management levels. In order to achieve this, we are working closely with Catalyst and their important Catalyst Accord initiative. We do not believe mandatory quotas are the right approach. Instead, we are building a strong foundation of business leaders who are committed to meaningful, sustainable gender balance in business leadership. Our name comes from an aspirational goal that we believe can be achieved in Canada through focused efforts by the business community. As in all business ventures, ‘what gets measured gets managed’ – a numeric goal provides real impetus for change, and our goal is for 30% of board seats and C-Suites to be held by women by 2022. The 30% Club Advisory Committee is comprised of senior men and women business leaders that believe that gender balance positively impacts business performance. Recognising the positive impact that gender balance at leadership levels can have on the economy, the 30% Club is committed to building a strong foundation of business leaders to champion meaningful, sustainable change in the gender balance of boards and executive committees. To accomplish this the Advisory Committee, in partnership with the Steering Committee, is working to engage Board Chairs and CEOs to commit to accelerate progress towards a minimum of 30% representation. Held at the Globe and Mail Centre, our 2019 International Women’s Day event gathered investors, not-for-profits, corporations and academia together to recognize this year’s #BalanceforBetter theme, one that provides a unified direction to guide and incite continuous collective action. Check out our highlight reel here, the event recap and action-oriented takeaways from our distinguished #BalanceforBetter speakers here, and our photo gallery from the event here. Catalyst is recognized with the Distinction Award from Brescia University College for their work and impact in advancing women in the workplace. NATIONAL’s Halifax office recently hosted a breakfast event with Brenda Trenowden, Head of Financial Institutions, Europe, ANZ Bank and Global Chair of the 30% Club. The event featured a riveting discussion between Brenda and Sarah Young, the Managing Partner of our Atlantic offices who also leads the Firm’s Talent Working Group, as well as a series of questions from the audience which was comprised of regional business leaders. Canadian Institutional Investors call for 30% women on boards and executive teams by 2022. Les investisseurs institutionnels canadiens demandent que les conseils d’administration et les équipes de direction comptent 30 % de femmes d’ici 2022. The #GoSponsorHer Campaign asks top executives to name a woman they will help support publicly. John Stackhouse will lead an on-stage conversation about the Campaign with two Co-Founders of #GoSponsorHer and some sponsors and sponsorees. The group will also discuss their advice for sponsorship success. Bruce Simpson, Senior Partner, McKinsey & Co.
Family Enterprise contributes an estimated 60% of Canada’s GDP. Globally, that number may be as high as 90%. Meanwhile, large publicly-listed corporations continue to garner the majority of attention when it comes to high-profile management discussions such as corporate governance, leadership and diversity. At this conference, we shift our focus to Family Enterprises in order to explore their successes at developing female leaders in senior positions. Tina Lee, CEO, T&T Supermarkets Inc.
Heather Partridge, Principal and Director, Wescan Capital Inc.
Joignez-vous à des chefs d’entreprise canadiens et montréalais intéressés à explorer les occasions qui émergent grâce à la diversité alors que Neil Bruce, Isabelle Courville et Victor G. Dodig discuteront de la façon dont la diversité dans les conseils d’administration favorise une meilleure prise de décision, au profit des diverses parties prenantes. Vous pouvez voir l’emplacement et réserver votre place de stationnement en ligne. Veuillez confirmer votre présence avant le 6 septembre. Un cocktail sera servi avant le panel de discussion et une table ronde. Join Canadian and Montreal business leaders interested in exploring the opportunities that emerge through diversity as Neil Bruce, Isabelle Courville and Victor G. Dodig, discuss how diversity in the boardroom enables better decision-making, benefiting multiple stakeholders. You may see the location and reserve your indoor parking space online. There will be cocktails before a panel discussion and round table. Join Canadian business leaders interested in exploring the opportunities that emerge through gender diversity as Peter T. Grauer and Victor G. Dodig, share experiences, roadblocks, key learnings and advice on what senior leaders can do to achieve gender diversity across all levels within organizations. Research has documented and experience has confirmed that men have a critical role to play in creating inclusive workplaces and accelerating progress for women. Many men are unfamiliar with how gender gaps in opportunity, pay, and advancement hurt them, too, both as leaders of companies and as members of families and communities.Organizations must enlist these men, in partnership with women, to work together as allies in changing the organizational norms and structures that perpetuate gender gaps. This event is especially targeted to male senior executives, Chief Human Resources Officers, and Chief Diversity Officerswho are seeking strategies for leveraging all talent in the workplace and advice about the most effective ways for women and men to partner together in ending gender inequalities at work. Please direct any questions to Joanna Harper at jharper@catalyst.org. The 30% Club Canada, Catalyst, Initiative for Women in Business, and IWF Canada invites you to celebrate International Women's Day and join the conversation: The Diversity Dividend. The Rotman School of Management, Toronto. Talent Talks: Dean Hopkins, CEO of OneEleven on leadership, culture, scaling-up, and the value of tapping into diverse talent. Dean Hopkins is an entrepreneur uber-coach who’s navigated his career through the tech bubble, the transformative era of the internet and the evolving tech ecosystem. A visionary and trailblazing leader, he recognizes the power of culture and nurtures a paying-it-forward spirit. Today, Hopkins leads OneEleven, a Toronto-based innovation hub dedicated to the success of high-performing scaleups. Boyden’s Ian Collyer and Joanna Goncalves sat down with Hopkins to talk leadership, culture, scaling-up, and the value of tapping into diverse talent. Read more here. For the latest 30% Club Canada updates check out our recent newsletter here. Salim Teja’s long career in tech has touched every part of the ecosystem, from entrepreneur, to investor, to corporate innovator. In his current role of President, Venture Services, at MaRS, he’s not only championing Canada’s tech ecosystem, he’s helping to guide it towards greater diversity — with initiatives in research, representation, and funding. Click here to learn more about what MaRS is doing. The journey towards a diverse and inclusive workplace can be long and difficult — especially in an industry that’s overwhelmingly male-dominated — but David Pathe, President and CEO of Canadian resource company Sherritt International, knows that the benefits still outweigh the challenges. Here’s how his organization is making change. At OMERS, diversity and inclusion isn’t just a goal on the horizon. Satish Rai, Chief Investment Officer with OMERS, explains how the organization has created a culture that puts respect and support first, with policies and daily actions that reinforce their inclusive message. Read more here. In this episode of McKinsey’s “Inside the Strategy Room” podcast, Senior Partner Celia Huber discusses her groundbreaking work on board diversity. Click here for the full podcast. ​In September 2017, sixteen Canadian asset owners and asset managers published a Statement of Intent to use their collective voice as public company investors and members of the 30% Club Investor Group to help drive meaningful progress on gender diversity across the country’s offices and boardrooms. One year on from our call to action, and one year closer to the 5-year, 30% target, the direction of travel is positive. While the statistics are all trending positively, progress continues to be slow. The 30% goal is still a long way off, and at the current rate, the idea of gender parity in Canada’s boardroom is unlikely to be achieved in many of our lifetimes. Clearly there is still much work to be done. Read the full release here. Over the next year, the 30% Club Canada and Women of Influence are partnering to explore the role of men, amplifying our efforts by joining together. We’ll be sharing the stories of allies — men who are advocating for gender equality in the workplace. These Champions of Change can act as visible role models, inspiring and guiding other men to follow in their footsteps. Read here for more information. In the often male-dominated tech industry, it’s rare to find a company with a good representation of women. At Wattpad, women are the majority, visible and in positions of power at every level. Allen Lau, co-founder and CEO, looks to his employees for guidance and diverse perspectives on what’s needed for an inclusive environment, and wholly commits the company to achieving that goal. Read more here. There’s a good news story worth talking about: Over the last few years, a uniquely Canadian strategy to tackle the pressing issue of gender inequality in the workplace has taken hold. In short, there is an emerging partnership between business, advocacy groups, investors and government. Read the full article here. The business case for diversity on boards is clear – research has shown increased shareholder value, better governance, improved decision making and more innovative approaches to problem solving. As organizations move forward working to see more women represented on boards, Canada’s current board renewal rate of 9 per cent a year makes it clear that we need to rethink renewal strategies. Click here to read more. VIA RAIL, Chair, Françoise Bertrand, a dedicated and bold leader, navigated her career by what challenged and inspired her. Paying little attention to the infamous glass ceiling during her 40-year career trajectory, her drive and ever-evolving nature led her to roles with Université du Québec, KPMG, and Groupe SECOR, advancing to CEO at the Société de radio-télévision du Québec, known today as Télé-Québec, and the Federation of Quebec Chambers of Commerce. Boyden’s Martin Richard and Joanna Goncalves sat down with Françoise to talk leadership, career drivers, and the value of networks and authenticity. Click here to read the interview. 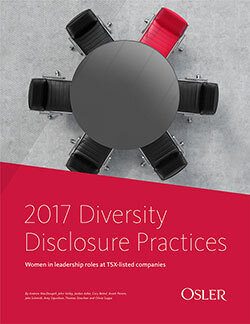 This is Osler’s fourth annual comprehensive report on diversity disclosure practices relating to women in leadership roles by TSX-listed companies. This year they found that the accelerated focus over the last year on diversity of board and executive teams among institutional investors, regulators and the media is having an impact on increasing the representation of women on boards, although the representation of women in executive officer positions is virtually unchanged. Board composition and gender diversity are on the radars of most CEOs and board chairs today. Here are eight tools to help companies build a gender-balanced board. Why does gender diversity on boards matter? Because purposeful board composition can enhance decision-making processes and augment an organization’s performance and market reputation. Here’s why more work must be done to boost gender diversity in Canada’s boardrooms. Blakes Board Report: Opportunities for Women General Counsel is the first benchmarking study in Canada on the professional background of board members, with a focus on legal professionals. Read more here. Boyden’s Sébastien Zuchowski and Chantal Hevey sat down with Mélanie to talk leadership, talent, and why true diversity can’t take shape without a pivotal culture change. To read the interview click here. We are thrilled to announce an unprecedented collaboration of seven advocacy groups, convened by the 30% Club Canada, working together to amplify and coordinate efforts to accelerate gender parity on boards and in executive positions. Read more here. The ICD has a suite of programs and services available to help you on the path to diversification. Click here for a selection of initiatives that may assist you with your diversification efforts. The Institute of Corporate Directors and Osler, Hoskin & Harcourt LLP have created a complimentary Board Diversity Policy template designed to help companies meet gender diversity disclosure requirements and to provide a tool for boards to begin or further their process of diversification. ​Read 30% club Canada report on creating stronger businesses and a stronger Canada through better gender balance. For the French version, click here. Research studies show a positive relationship between stronger business performance, economic growth and the representation of women on boardsand in C-suites. For the past 25 years, women have made up the majority of university graduates across each province in Canada, however the proportion of women in corporate leadership roles does not reflect this. While the proportion of women directors in Canada has increased over time, it is essential that Canadian business leaders strategically plan to grow this momentum to ensure sustainability of gender balance. Human capital is a critical driver of growth in the economy and women are a sign cant source of untapped talent. Research shows that women aspire to be business leaders just as much as men, and despite these aspirations, educated, qualified women decide to opt out of certain organizations and industries. To create stronger businesses and a stronger Canada, it’s imperative for business leaders to create and sustain a work culture that encourages women to opt-in and stay-in. This white paper covers the following topics: gender balanced leadership creates stronger businesses and a stronger Canada, opportunities for gender balance in the Canadian market and globally, why women opt out of certain companies and industries and what companies can do to create better gender balance. Public policy and societal norms are not a focus of this paper. Boyden’s Jessa Chupik and Joanna Conclaves sat down with Maureen Jensen, Ontario Securities Commission Chair & CEO, to talk leadership and the power of diversity. Click here to view the article.